Women today are surrounded by so many pressures. Pressures to succeed and beat last week’s record; pressure to make decisions based on the wants and needs of other people; pressure to get to “the end;” and pressure to have it all together. There is so much stigma around feelings. It’s much easier and much less vulnerable to stay silent; suppress those feelings, put on that lipstick, and smile. But what’s really behind that smile? A lot of the time its days, weeks, months, or even years of pain. Years of pain suppressed into one single body. Years of pain hidden behind a perfectly lined smile. This smiling does not make the pain go away. Rather, it makes the pain more powerful over us. The longer and harder we suppress, the larger and more powerful this pain becomes. It begins to take a toll on our physical health. We can’t sleep, we can’t eat, we can’t think straight. We sleep too much, we eat too much, we can’t stop thinking. Our bodies are brilliant, and they have a pretty good way of telling us what we need. The problem is that we don’t have a very good way of listening. There are signs all around us signaling that help is needed. But avoiding these signs is way easier than facing our demons head on. This avoidance leads to depression, addiction, and ultimately the lowest emotion of them all: apathy. We stop caring. We stop feeling completely. And what then? What is a world without feeling? A world without feeling is a world without love. And what is a world without love? Non-existent. It makes sense that society’s expectation of women sends them into a state of depression, anxiety, low self-esteem, and insecurity. Below, are four steps that will help guide you through moving past the pressure to put that smile on your face, and instead express what you’re really feeling. Life can get so hectic. Balancing family, school work, friendships, romantic relationships, sports and extracurriculars, church, physical health, and more is not an easy task. It can often feel like there is so much to do and no time to slow down. However, without slowing down, this stress can build up and lead to that depression and anxiety we all hate so much. Here at Replenish Her Counseling, we teach our clients mindfulness exercises to find some calm in the storm and work towards a more peaceful, mindful life. SET AN INTENTION FOR EACH DAY. Setting an intention for each day can give you something to stay focused on so you do not feel so cluttered and lost. Maybe your intention is to say something kind to everyone you talk to that day, or by making a point to let your loved ones know you love them. An intention will bring part of your awareness each day to something that really matters to YOU. Women are known to cry more than men. But how often do you allow yourself to be vulnerable and cry in front of others? How often do you allow yourself to share your pain with others? In a world where you are told to keep it all together, it’s easy to find hiding your sadness and pain the only way to cope. You want to appear strong and uncrushable; But the truth is, crying is STRONG, and vulnerability is STRONG. There is so much strength in what the world views as falling apart. You are not weak for feeling sad or weak for wanting to cry. Allowing yourself to be in touch with your emotions is one of the strongest and most loving things you can do for yourself. Identifying and embracing emotions is a large part of what we work on with our clients at Replenish Her. It can be so easy to help others with their emotions and not so easy to help yourself. In fact, Replenish Her Counseling was named for the mission to help replenish and restore the emptiness that happens when a client constantly pours into others, and rarely gets poured into themselves. LISTEN TO YOURSELF. ASK YOURSELF, WHAT DO I NEED? It can be so easy to spend time helping others. Helping others make you feel good. It makes you feel needed. Everyone wants to feel needed and important. However, in taking care of others, it’s easy to forget about yourself. You might then find yourself listening to others tell you how you should and should not feel. The truth is, your feelings are always valid and suppressing these feelings because someone else told you, you shouldn’t feel that way is what leads to hiding behind that smile. The truth is that everyone experiences situations differently and everyone has different feelings and reactions. That does not mean that your feelings are not valid. Allow yourself to feel your emotions. Frown when you need to frown. Smile when you need to smile. Stop running from the pain. 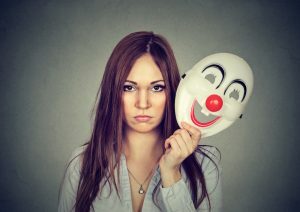 If you are ready to stop masking your pain behind a smile, consider Replenish Her Counseling. We would love to help you process your emotions, validate your feelings, and work towards creating a more balanced, self-loving life. Who knows? You may just learn to smile, and mean it.